Michelin Star Restaurant l’Ecrivain is one of the very best restaurants in Ireland, Derry and Sallyanne have been delivering exciting cuisine and unforgettable dining experiences in their Baggot Street restaurant. 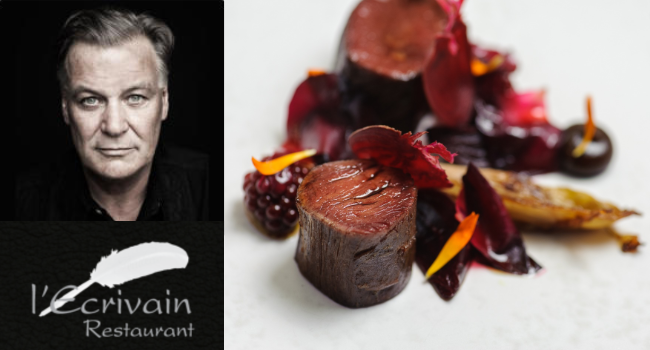 TheTaste are giving readers the chance to Experience a Magical Michelin Evening at L’Ecrivain: 6 Course Tasting Menu for Two for only €99. If there is one restaurant to treat yourself to in 2018 this is the offer we would highly recommend. Dublin born Derry trained in the classical French tradition in the Man Friday in Kinsale. He came home to Dublin to continue his training under the direction of John Howard in Le Coq Hardi for four years. He then spent eight years as Head Chef in le Bon Appetit restaurant, where his aspirations were always to open a place of his own. All the team at l’Ecrivain look forward to welcoming you. – This voucher, valued at €160, can be redeemed towards the Six Course Tasting Menu only. – Vouchers MUST be redeemed within the validity dates. – Advance Booking is essential to ensure you get your preferred date- It is advised to book on the day of purchase or at least two weeks in advance as there is limited availability. – Telephone bookings will not be accepted with this offer. – This voucher can be used on the dates above ONLY. – This voucher is not redeemable on Fridays or Saturdays. The restaurant is closed on Sundays & Bank Holiday Mondays. – Not available to be used at lunchtimes. – A hard copy of the voucher is not required. – One voucher redeemable for table of two people only – 2 vouchers may be used on request for table of four depending on availability. – Voucher must be redeemed in full in one visit. – Wine not included with this offer. – A 12.5% gratuity will be added to full value of the voucher (€160) and any extras ordered on the night. – Vouchers will not be valid or extended after their expiry date.